EcoLibertarianism combines the Georgist/geoclassical economic insights of geolibertarianism with the broader ecological and decentralist concerns of green libertarianism. EcoLibertarianism primarily differs from classical (or "royal") libertarianism in how property relates to the commons. In EcoLibertarianism, interference with general access to the commons is defined as aggression and requires compensation to (and/or policing by) the community interfered with. Interference can include pollution, congestion, consumption, or (generally) any use that significantly diminishes the ability of the commons to sustainably support its reasonable use by the community. In particular, EcoLibertarianism denies that locations can be fully owned in the same way that you can acquire material property by rearranging unowned matter. Eclusive possessors of locations must therefore compensate the excluded community by returning the location's geo-rent to them. Geo-rent is the excess production obtained by using a site in its most productive use, compared to the production obtained by applying equivalent inputs of labor and capital at the most productive site where the application doesn't require (additional) payments for use of the site. Thus when sites are freely available that are equivalently productive (modulo improvements and other inputs) compared to yours, then you owe zero geo-rent to the neighbors you exclude from your land. financing of community services (e.g. roads, pipes, wires) through congestion fees and tapping the increased ground rent of the benefiting land. 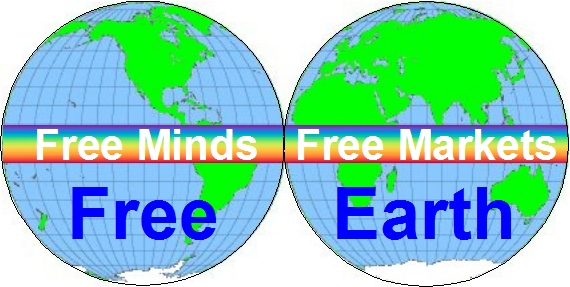 A more complete explanation of EcoLibertarianism is in the draft Free Earth Manifesto. It is a statement of principles about how individual rights relate to ecology, geography, and community. These statements are intended to win assent from green libertarians, libertarian-leaning greens, geolibertarians, and ecologically-minded economists. The meaning of "community" in it intentionally does not exclude completely voluntary communities, so as to not rule out assent from geoanarchists. Carbon Tax Calculations Estimate of the magnitude of a carbon tax needed to replace the personal income tax. Georgism Assumes A Labor Theory of Value? How Did The Community Come To Own The Commons?